It is time to see Oxfords and Derbies in a completely new light. Our collection of contemporary men’s shoes boasts fashionable pairings of different cuts and colours. Classic men’s shoes are the ideal choice for many occasions. But when you need to make an unforgettable appearance, our contemporary collection is the right answer for you. Where else you will find a splendid two-tone Oxford shining in dark yellow and gold? Or a Wholecut Oxford, completely crafted from one single leather part? If you prefer box calf leather our shop is the ideal choice. The combination of colours, decoration and bold seam work, creates shoes in the finest Oxford and Derby traditions, but with a vibrancy suiting them perfectly to smart-casual wear. It should be noted that crafted leather content defines high quality men’s shoes. Here, the upper and insole of all our shoe models are made from leather. The inner lining and outsole are crafted from finest Italian leather, too, guaranteeing our shoes the right mix of breathability, sleekness and style. If you like a little more leather, take a look at our Boot collection. Each of our contemporary men’s shoes is Goodyear-welted and handmade using traditional methods. There are the creations of a master craftsman, simultaneously providing a delicate structure with the optimum protection feet require from the stress and strain of everyday life. Like all our footwear, these shoes are sturdy, breathable and durable items, which are easily resoled. 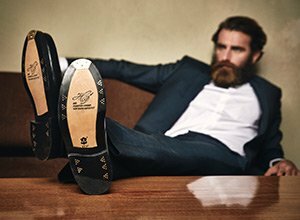 Produced with painstaking care by a Spanish manufacturer, just one of our classic men’s shoes is made of 65 separate parts. In all, around 210 skilled operations are used to craft each of our extraordinary men’s shoes. Only high-grade materials are used for the shoe manufacturing, which guarantees the highest quality. All shoes are additionally equipped with a so-called “gentleman’s corner” and an immaculate finish, too. The former prevents catching the fringe of your trousers leg on the heel, whilst the finish on the leather ensures an elegant appearance and fabulous shining toecap. At SHOEPASSION.com, we cooperate directly with shoe manufacturers to offer the most efficient supply possible. By cutting out the middle man, we can make sure to pass savings on directly to our customers. All in all, we offer an incomparably fair price for Goodyear-welted men’s shoes. To compliment the extraordinary elegance of our men's shoes, we supply them in a premium package: A simple black box encloses one pair of our men's footwear. In addition, we send each customer a set of spare shoelaces, one shoe bag, which offers protection against dirt and scratches, and a brief guide with helpful shoe-care advice. If properly cared for, our shoes will remain looking great, year after year and sometimes even for decades. These shoes are the creation of a master craftsman, expressing the social standing and fine taste of the wearer while simultaneously providing the delicate structure of the feet with optimum protection from the stress and strain of everyday life.